Richard and Judy hosted the very successful book club on Channel 4, when they moved on, the book club concept stayed with Channel 4 whilst they teamed up with W H Smith to launch their own, new club in 2010. "The Tides are a family with dark secrets. Haunted by the events of one tragic day ten years ago, they are each, in their own way, struggling to move forwards with their lives. Dora, the youngest daughter, lives in a ramshackle East End warehouse with her artist boyfriend Dan. Dora is doing a good job of skating across the surface of her life - but when she discovers she is pregnant the news leaves her shaken and staring back at the darkness of a long-held guilt. Returning to Clifftops, the rambling family house perched high on the Dorset coastline, Dora must confront her past. Clifftops hasn't changed in years, and moving through it's rooms and gardens, Dora can still feel the echo of that terrible summer's day when life changed forever for the Tides. As Dora begins her search for clues surrounding the events of that fateful day, she comes to realise that the path to redemption may rest with her troubled sister, Cassie. If Dora can unlock the secrets Cassie swore she would take to her grave, just maybe she will have a shot at salvation. But can long-held secrets ever really be forgiven? And even if you do manage to forgive and forget. how do you ever allow yourself to truly love again?" "For Maggie and Bill it was love at first sight ..... One impulsive wedding later and with the arrival of three perfect children, Jake, Aly and Stan, the Barrett family seem to have it all. Until the day their world stops turning. When Jake dies suddenly, they're swept away on a tide of grief that fractures Maggie and Bill's marriage. She and the children are left clinging to the wreckage of their family. And they need help, because in her grief Maggie is in danger of losing Aly and Stan too. Enter Kate, housekeeper, companion and shoulder to cry on. She's here to pick up the pieces and fix what isn't completely broken. But can Maggie trust Kate? And why is Kate so keen to help?" "A bewitching tale of heartbreak and hope set in 1920s Alaska. Jack and Mabel have staked everything on making a fresh start for themselves in a homestead at 'the world's edge' in the raw Alaskan wilderness. But as the days grow shorter, Jack is losing his battle to clear the land, and Mabel can no longer contain her grief for the baby she lost many years before. The evening the first snow falls, their mood unaccountably changes. In a moment of tenderness, the pair are suprised to find themselves building a snowman - or rather a snowgirl - together. The next morning, all traces of her have disappeared, and Jack can't quite shake the notion that he glimpsed a small figure - a child? - running through the spruce trees in the dawn light." "Spain, 1936, and the brink of Civil War. Young, poor Sara Quiroga is swept up in a whirlwind romance with her wily lover Ramiro. Fleeing Madrid together for Morocco, her love blinds her to his real failings. Soon abandoned, left penniless and in debt to the authorities, she has to rely on the one skill she still possesses; sewing. Taken under the wing of the bullish but caring housekeeper Candelaria, Sara is able to sew for the glamorous foreign English and German women in Tetouan. Privy to their unbridled gossip, Sara becomes invaluable to the British Secret Service, a position that is filled with untold risk." "Nestled high in the Italian Alps lies Vilminore, home to Ciro, a strapping mountain boy. Close by lives Enza, a practical girl who longs only for a happy life for her family. When the two meet as teenagers, it seems it could be the start of a life together ......... Then Ciro catches the local priest in a scandal and is sent to America as an apprentice to a shoe maker in Little Italy, leaving behind a bereft Enza. 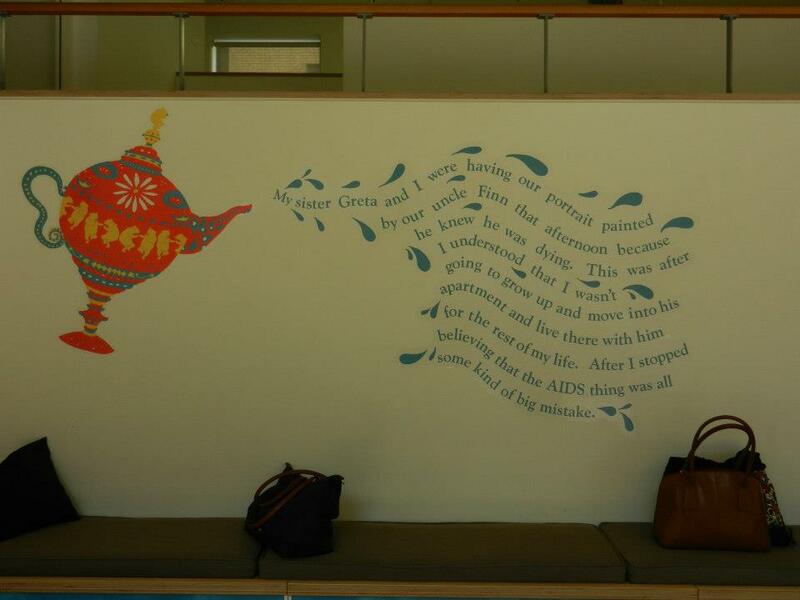 Her family faces disaster and she, too, is forced to flee to America with her father to secure their future." "A search for missing documents in an international mining company becomes a voyage into dangerous waters. A dead friend, a lost lover and a clutch of mysteries from Jonathan Kellaway's youth in Cornwall and Italy in the late 1960s come back to haunt him when he is tasked with discovering why there is a gaping hole in his employer's records - and to tempt him with the hope that he may at last learn the truth about the tragedies of those years. It is a truth that has claimed several victims before. If he pursues it hard and long enough, he may only add himself to the list. But pursue it he will. Because the truth, he comes to realise, is the secret that has consumed his life. This time he will not stop ........ until he has found it." "A little boy was found dead in a children's playground ....... Daniel Hunter has spent years defending lost causes as a solicitor in London. But his life changes when he is introduced to Sebastian, an eleven-year-old accused of murdering an innocent young boy. As he plunges into the muddy depths of Sebastian's troubled home life, Daniel thinks back to his own childhood in foster care - and to Minnie, the woman whose love saved him, until she, too, betrayed him so badly that he cut her out of his life. But what crime did Minnie commit that made Daniel disregard her for fifteen years? And will Daniel's identification with a child on trial for murder make him question everything he ever believed in?" 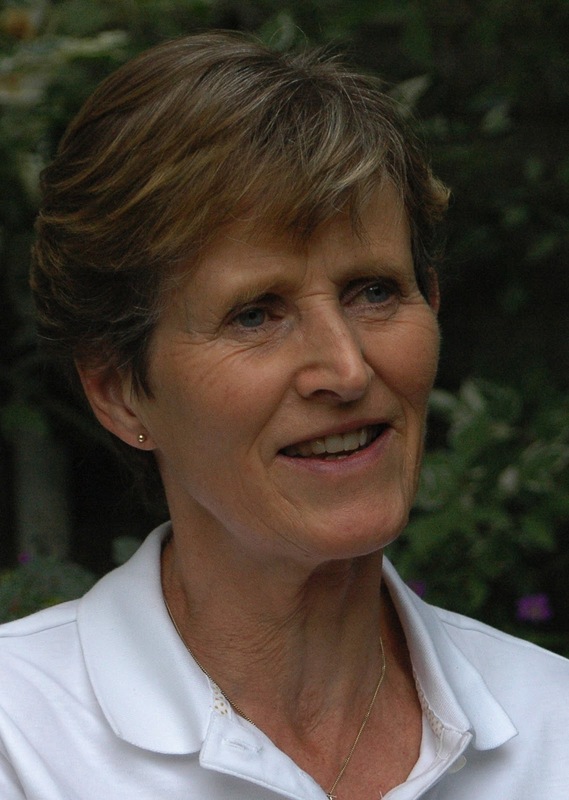 "In the winter of 1952, Isabel Carey moves to the East Riding of Yorkshire with her husband Philip, a GP. With Philip spending long hours on call, Isabel finds herself isolated and lonely as she strives to adjust to the realities of married life. Woken by intense cold one night, she discovers an old RAF greatcoat in the back of a cupboard. Sleeping under it for warmth, she starts to dream. And not long afterwards, while her husband is out, she is startled by a knock at her window. Outside is a young RAF pilot, waiting to come in. His name is Alec, and his powerful presence both disturbs and excites her. Her initial alarm soon fades, and they begin an intense affair. But nothing has prepared her for the truth about Alec's life, nor the impact it will have on hers ....."
D-Day, 6 June 1944, the turning point of the Second World War, was a victory of arms. But it was also a triumph for a different kind of operation: one of deceit, aimed at convincing the Nazis that Calais and Norway, not Normandy, were the targets of the 150,000-strong invasion force. The deception involved every branch of Allied wartime intelligence: the Bletchley Park code-breakers, MI5, MI6, SOE, Scientific Intelligence, the FBI, and the French Resistance. But at it's heart was the 'Double Cross System', a team of double agents controlled by the secret Twenty Committee, so named because Twenty in Roman numerals forms a double cross." "THE GAME'S AFOOT........ It is November 1890 and London is gripped by a merciless winter. Sherlock Holmes and Doctor Watson are enjoying tea by the fire when an agitated gentleman arrives unannounced at 221b Baker Street. He begs Holmes for help, telling the unnerving story of a scar-face man with piercing eyes who has stalked him in recent weeks. Sherlock Holmes is back with all the nuance, pace and powers of deduction that make him the world's greatest and most celebrated detective." 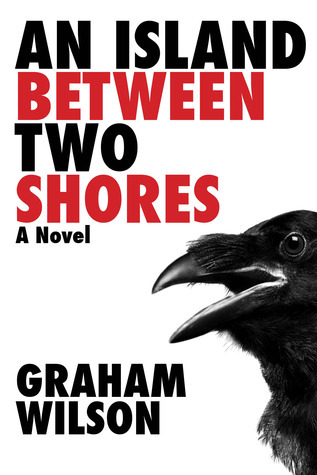 At just 148 pages long, An Island Between Two Shores by Graham Wilson can be read in one sitting, in fact I think really should be read like this as the story is compelling, often brutal but beautifully told. The Island of the title is a small stretch of land separated from the shores by a fast-flowing, lethal river, and is where Liana finds herself washed up, on her own, and struggling to survive. Liana is an 18 year old French girl, she came to the Klondike with her Father after the untimely death of her Mother. Her Father was killed in a tragic accident and she has spent the last few years living in the desolate Arctic with only Henry to look out for her. When Henry is no longer around, Liana must try to find her way back to the town, as she travels the river in a small canoe she feels confident that the town is not far away, then she hits the fast flowing rapids and is washed up on the island. Graham Wilson's writing is sparse and to the point. He describes the frigid Arctic landscape so well that the words on the page can produce shivers of cold. Liana's fight against nature is a compelling read, as the weather gets colder and she gets weaker and hungrier her mind begins to wander and this is when the reader learns more about her past. Liana's only companion on the island is a black raven, the bird watches her intently and Liana knows that it is just waiting for her to die - the relationship between the two is built up slowly and ends quite brutally. It is clear from the writing that Graham Wilson knows the area well, he captures the desolation, the isolation and the fear so well in this story. The final chapter is a revelation, and one that some readers may find a little strange, as I did when I read it. However, it's a realistic ending, if not the hoped-for finale. An Island Between Two Shores is published in Canada by Friday 501 - an independent publisher based in the Yukon, and is available in the UK via Amazon as an e-book. Graham Wilson has a website here and is also on Facebook. Many thanks go to Graham for sending me a hard copy for review. What a fabulous title! I came across Frances Garrood's writing when I read The Birds, The Bees and Other Secrets back in 2009; a book that really did not get the publicity that it deserved, I loved it. Her latest novel is Basic Theology for Fallen Women and was published at the end of June this year, in e-book format only, published by Thirst eDitions. I have never wanted a Kindle, I have over 1000 books on my shelves that I have yet to read and am perfectly happy being an old-fashioned type of girl and sticking with 'tree' books. However, I did want to read Basic Theology and my partner recently bought an iPad, so I got him to download it for me and thought I'd give this e-reading a go! Basic Theology for Fallen Women is a sort of self-help group, organised by the local parish priest. The three members; Alice, Mavis and Gabs have really fallen in the eyes of the Catholic Church - each one of them is a mistress, and the group meetings are designed to bring them back into the fold of the Church. With nothing in common except their sins, these three women would probably never have met if it were not for the priest. Mousy Mavis who lives with her Mother Maudie and a venomous cat called Pussolini, single mother Alice whose long-time married lover is just about to become a father, and good-time girl Gabs. These three fallen women form an unlikely but firm friendship, sharing their secret lives, their heartache, their frustrations and their inner-most fears. Over the next few months, each one of them reveals their vulnerabilities and their hopes, feeling comfortable that only other women in their situation could understand them. 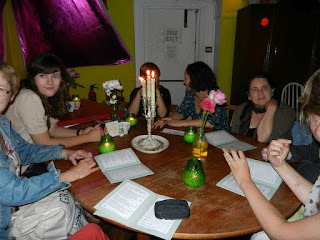 Frances Garrood writes with humour and sensitivity, there were times when I snorted with laughter and others when I gulped back a tear or two. No erotica in this story, but a bit of raunchiness now and again. The three main characters are drawn wonderfully well, no matter if you agree with their morals, you cannot help but love each one of them. The women are backed up by a great supporting cast of characters, not least Mavis' mother Maudie who although ageing and confused at times, often hits the nail right on the head - adding some comedy along the way. Funny, clever, wry and poignant - I enjoyed my time with the Fallen Women, and will look forward to reading more from Frances Garrood. So, I've read an e-book and what did I think of the experience? An iPad is very different to a Kindle - it's not as handy, or as portable but the Kindle App does allow one to see how the text will look on screen. I do appreciate the benefits of a Kindle, I really do, especially for travelling, or for readers who have difficulty with sight or turning pages, but I'm not converted. I felt a bit lost without a physical book - I take my book everywhere and this just didn't seem 'right' somehow. I missed having a cover, and blurb to read, I missed being able to flick back a few pages to check on something - I guess I just missed the 'book' really. 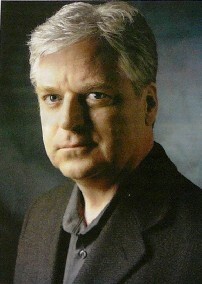 Linwood Barclay is a hugely successful author. His back catalogue include his memoir Last Resort, a series of comic thrillers featuring the character Zach Walker and seven very popular stand-alone novels. The first of these stand-alones is No Time For Goodbye which was the single bestselling novel in the UK in 2008, and has been optioned for a movie. 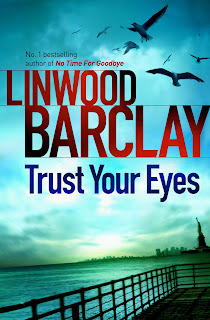 Linwood Barclay's latest release Trust Your Eyes will be published in the UK by Orion on 27 September 2012. Trust Your Eyes hooked me in from the first sentence, with a prologue that is intriguing and taunts the reader with snippets of what is yet to come. Ray and Thomas Kilbride are two brothers and very different characters. Thomas spends his days in his room, memorising city maps from all over the world. He is addicted to the website Whirl360 - a site that allows the user to visit anywhere in the world from the comfort of their own home. Thomas does nothing but this, except eat, take his medication and make very infrequent trips to his psychiatrist. Thomas is working secretly for the CIA, and speaks regularly to ex President Bill Clinton .... or does he? Ray is an illustrator, he moved away some time age, but is now home trying to sort out the family home and what to do about Thomas after the accidental death of their father .... or what it an accident? When Whirl360 throws up something suspicious looking in a random window, on a random street in New York, Thomas is convinced that there has been a murder. The Kilbride brothers find themselves smack bang in the middle of a deadly conspiracy game, being played out by some powerful, and very dangerous people. Trust Your Eyes is a multi-layered, complicated thriller, told in an accessible and totally uncomplicated way. The suspense is taut right from the beginning, the pace is furious, the tension is often unrelenting. 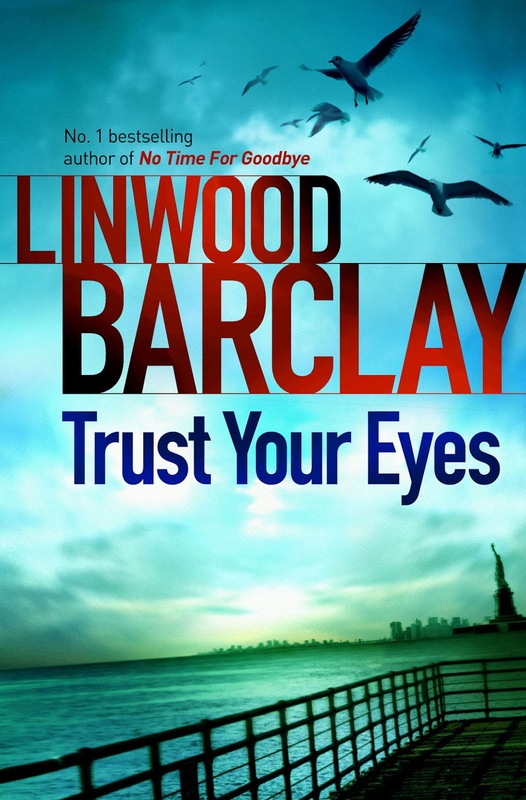 There are enough red herrings thrown at the reader to start a stall on a fish market, and just when you think you've worked something out Linwood Barclay throws another spanner into the works. I certainly had every one of my theories blown way way out of the window as I was reading, which only keeps up the level of suspense right up until the very last sentence. The different threads of the story are effortlessly tied together, the characters are scarily life like. The issues of mental illness is dealt with sensitively, yet conveys the frustration that can be caused to family members, and also the devastation at times. Linwood Barclay is a master at suspenseful and thrilling writing, I enjoyed this novel immensely and thank Real Readers for the opportunity to read and review an advance copy. You can see the trailer for Trust Your Eyes here. Linwood Barclay has a website, and you can follow him on Twitter here. Regular followers will know that I've been selected to take part in the Pan Macmillan Reading Groups Panel, the first meeting was on Monday and I blogged about my day in London here. 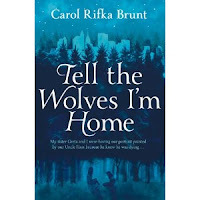 The first book chosen for the Panel is the wonderful Tell The Wolves I'm Home - a debut novel by Carol Rifka Brunt which was published in hardback in June this year. I read and reviewed it back in April, if you want to know what I thought of it you can read my review here. I have a beautiful hardback copy of Tell The Wolves I'm Home to give away to one of my blog readers. Carol Rifka Brunt was kind enough to sign it for me when I met her on Monday as part of the Panel. To enter the giveaway, just comment on this post and fill out the form below - the competition will be open for 7 days. You can earn extra entries by following me on Twitter and tweeting about the contest. Tinder Press is the new imprint from Headline Publishing and will be launched in spring 2013. 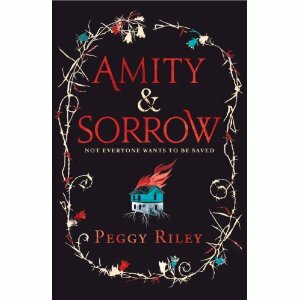 Amity and Sorrow by Peggy Riley will be one of the first releases. Headline Publishing Group is delighted to announce the launch of a new imprint, Tinder Press. Tinder Press is to be a distinct imprint publishing 10–12 titles a year, standing alongside Headline’s existing imprints. 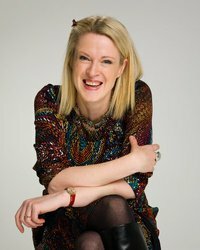 Tinder Press is created to build on recent Headline successes, for example Maggie O’Farrell’s Costa Novel Award winning THE HAND THAT FIRST HELD MINE,Sarah Winman’s Galaxy National Book Award winning WHEN GOD WAS A RABBIT, and Andrea Levy’s Man Booker prize shortlisted THE LONG SONG. The imprint will be steered byMary-Anne Harrington, Fiction Publisher, andLeah Woodburn, Associate Publisher, who have a remit to publish extraordinary stories from original voices: books that inspire a passionate response and will stand the test of time. The Tinder Press list will launch in spring 2013 and will include playwright Peggy Riley’s AMITY AND SORROW, an extraordinary debut about sisters in an end-of-the-world cult, run by their father; THE YONAHLOSSEE RIDING CAMP FOR GIRLS by Anton DiSclafani, a lush first novel of Southern decorum, family secrets and girls’ school rituals; Michel Rostain’s THE SON, a bestseller in his native France, and winner of the Prix Goncourt Debut Novel award; SNAPPER, Brian Kimberling’s heartfelt and humorous first novel about love and birdwatching in rural Indiana, which was awarded the Janklow and Nesbit Bath Spa Prize; and Maggie O’Farrell’s sixth novel, the story of four eventful days in the life of an Irish family in the heatwave of 1976. Although Amity & Sorrow is a fairly short novel at just 284 pages in the advance paperback edition, it is an intense and at times very difficult story to read. The subject matter is quite harrowing, and a subject that is rarely touched upon in fiction, and the writing is quite unique and distinct - it takes a little while to get used to the style. Amaranth and her two daughters; Amity and Sorrow are fleeing their home, they have driven across country for four days and the only reason that they have stopped is because Amaranth has crashed the car. Stranded in the middle of nowhere, not knowing where they are, or where to go, they are discovered by Brad - a farmer who seems unconcerned by their plight, doesn't comment on their strange dress and allows them to camp out on his land. Amaranth cannot let go of her memories and despite the fact that she knows that she had to flee, her thoughts return time and time again to her husband; the father of her girls. Amaranth is his first wife, the first of his 50 wives and she was instrumental in establishing the cult that they have left behind. Amity and Sorrow have no idea what it is like to speak with ordinary people, to allow anyone to see their hair, to walk through a field. They have no conception of what is acceptable behaviour in the real world. All they have known is life as part of a huge family, with rules, with terror, with abuse. Amity relishes this new world, but Sorrow wants nothing more than to return to her father and their old life. A lot of this story is told in 'flash back' form - when Amaranth remembers their life and how they were treated. The reader has quite a lot of reading between the lines to do - as events emerge slowly and are often hinted at, rather than explained fully. Reading Amity and Sorrow reminded me of watching films by director M Night Shyamalan, especially the film The Village. There is a darkness about the writing and about the story that can be quite creepy at times. Amity and Sorrow is an intriguing story with an ending that is unexpected and quite shocking and leaves the reader with lots of questions. Peggy Riley is an accomplished author, with an unusual and quite quirky writing style that although fairly difficult to engage with at the beginning, becomes enchanting by the end. My thanks to Sam Eades from Headline for sending a copy for review. "A group of enthusiastic reading group members to form the panel and meet authors and editors, visit Pan Macmillan HQ, receive plenty of free books and contribute to reading group material for four perfect reading group reads. The Pan Macmillan reading groups and book clubs panel was inspired by Tell the Wolves I’m Home by Carol Rifka Brunt, a startling debut novel and the first book chosen for the panel." 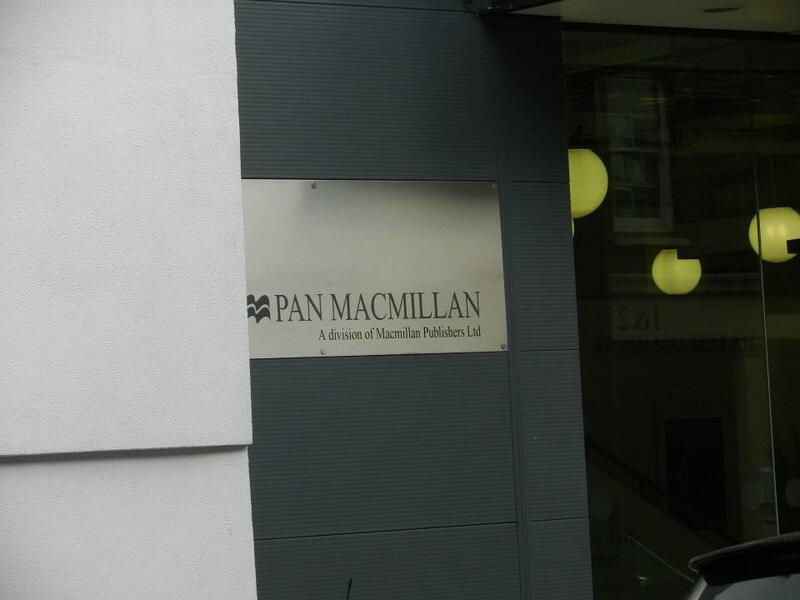 The first meeting was yesterday at Pan Macmillan Towers in London. 200 people applied to be part of the panel, and 20 were selected. 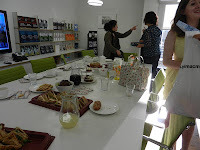 Yesterday 11 of those 20 members met to discuss Tell The Wolves I'm Home with Pan Macmillan staff, the Reading Agency and the author Carol Rifka Brunt. I have to admit that I was a little nervous, but very very excited. I don't go to London very often, so it's a bit of an adventure, going to the big city. Here in sleepy Lincolnshire we class more than 4 cars waiting at the traffic lights as a traffic jam. I took the train from Retford and spent a pleasant 90 minutes or so reading my book before arriving in London. It was a beautiful day, very sunny and warm. After stopping off for a quick expresso and a biscuit I made my way to Pan Macmillan Towers. Yes, I was a bit overwhelmed and yes, like a real tourist I took loads of photos. This was a real publishing house, full of beautiful displays, and art and the friendliest bunch of people ever. The reception is a shrine to Tell The Wolves I'm Home and this certainly broke the ice and soon I was chatting away with the other members as we waited in reception. There were cakes! Lots of them, and tea and coffee, juice and biscuits. Those Pan Macmillan folk really know how to get the best discussion going. 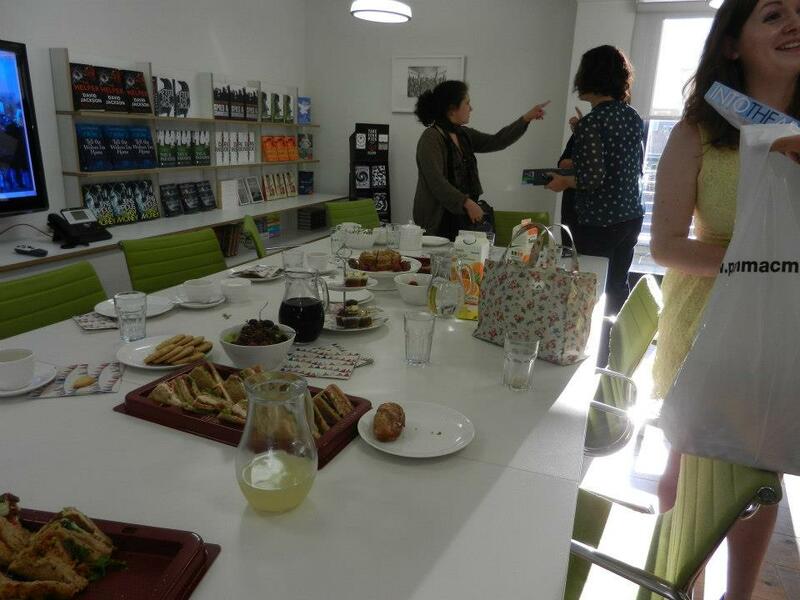 Surrounded by new hardback books and cakes and invited to come and talk about books - I was in heaven! We had a wonderful debate about the book, everyone added something and views were expressed freely. It's really great to talk to people in 'real life' about the books that you love - I tend to speak online about books and although it's enjoyable, it's just not the same as a room full of passionate readers ....... and cake! We were not let off lightly though, the next step is for us to produce the content for the Readers Guide at the back of the soon to be released paperback edition - we want to make it a little 'different', with content that will make the reader think a little more and a little deeper about the story. Then there were sandwiches - yes, more food - delicious cheese and ham for me, and another biscuit or two! Carol Rifka Brunt arrived and read from the book, she was then very brave and answered our questions. Carol was very very friendly, she took on board our views and debated them with us, she told us a little about the background of the novel and how it came to be written. I was a little in awe of her at first, but by the end of our chat, I felt comfortable and the chat was all very natural. Chase Marmalade Vodka, Vanilla Ice Cream, Peach Puree"
It was delicious, they all looked delicious and loosened everyone's tongues - as if they needed any more loosening. We spent the next hour chatting, getting to know a bit about each other, sharing book recommendations, swapping Twitter names and Blog addresses - time just flew by. I was sad when it was time to leave, but am really looking forward to our next meeting - sometime in November, and hopefully meeting the other members of the Panel who were unable to make it yesterday. A huge thanks to Jodie and Jen and the team at Pan Macmillan for being fabulous hosts, to The Reading Agency for backing the Panel and to Carol Rifka Brunt for answering our endless questions. I reviewed Tell The Wolves I'm Home back in April, you can see my review here. 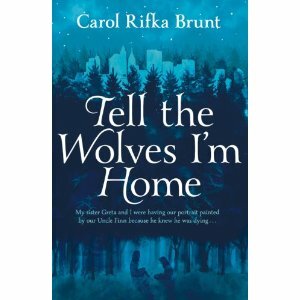 hardback copy of Tell The Wolves I'm Home, signed by Carol Rifka Brunt. The title of Wendy Jones' first novel sums up just what the story is about, and although it's a bit of a mouthful, it really is the perfect title for this wonderful story. 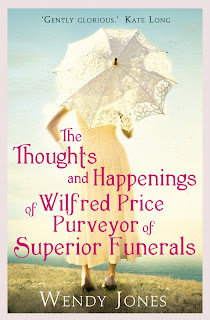 Looking at the cover, which depicts the back view of a shapely young woman in a beautiful dress, the reader can suppose that many of Wilfred's thoughts centre around his relationships. The story is set in the small Welsh town of Narbeth in the early 1920s. Wendy Jones has brought this insular, sometimes petty, often snobbish town and it's inhabitants to life so well. Wilfred has lived in Narbeth for all of his life, now in his late 20s, he's been the town undertaker since finishing his apprenticeship under Mr Ogmore Auden some years before. Grace Reece has also lived in Narbeth since she was a child. Grace is the only daughter of the local Doctor and his rather haughty wife, her brother Madoc is in the Army, and the apple of his mother's eye. Wilfred and Grace are enjoying a picnic together, when out of the blue he proposes to her. Grace is delighted, Wilfred is horrified by what he has done, and realises that his mind was turned by Grace's beautiful yellow dress, that showed just a little more cleavage than is acceptable. Wilfred does not love Grace. The characters appear quite simple and straightforward at first. Wilfred has got himself into a situation that he needs to get out of but he has no experience with women as his Mother died four days after he was born and he has no sisters. He's a kind soul at heart and also knows that if he just dumps Grace, his business will suffer. Grace is a very unhappy girl, delighted to be 'engaged', and ignoring the fact that Wilfred seems to be avoiding her. There were times when I wanted to shake Wilfred, and at first I really disliked Grace. As the story moves on though, the reader learns that Grace is not what she at first seems, and is hiding heartbreak and horror from everyone. Wendy Jones handles these hidden secrets very delicately, allowing the reader to gradually realise that all is not what is seems in sleepy Narbeth. The sense of place, the characters and the community spirit shine through in this novel. There is a sprinkling of humour, lots of secrets, passion and wonderful dialogue. I enjoyed Wilfred Price far more than I expected to and will look forward to more from this author. 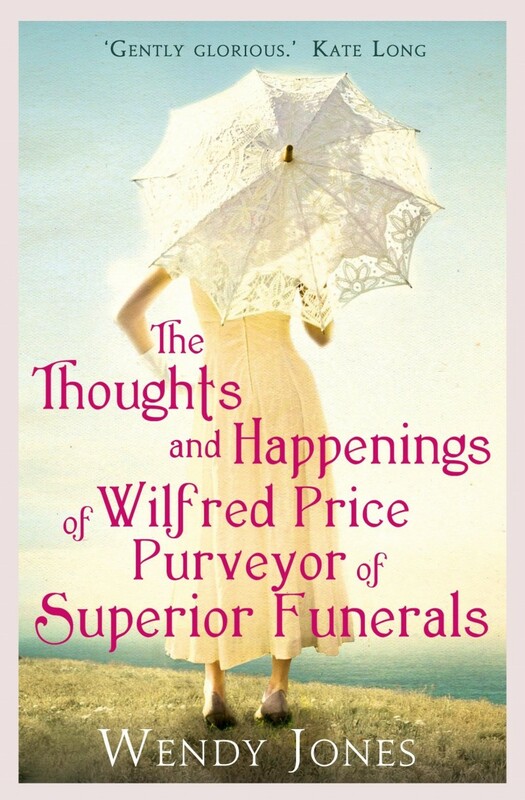 The Thoughts and Happenings of Wilfred Price Purveyor of Superior Funerals was published in paperback by Corsair, an imprint of Constable & Robinson on 21 June. My thanks to Lauren from Constable & Robinson for sending a copy for review. 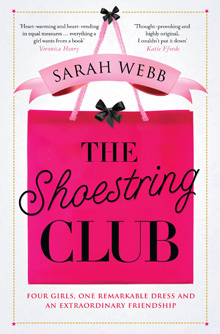 The Shoestring Club is Sarah Webb's 10th adult novel, she also writes children's books including the very successful Amy Green series. It's been quite some time since I read anything from this author, and was delighted to receive an advance copy of The Shoestring Club to review. At first glance, and after reading the blurb on the back of the book, it would be fair to assume that The Shoestring Club is going to be a light read, easy and maybe a bit fluffy. Julia Schuster (Jules to her friends) is the lead character of the story. Life is not going so well for Jules, she has no money, her job bores her, her sister bosses her around and her boyfriend Ed has announced his engagement to her (ex) best friend Lainy. When a beautiful designer dress arrives at Shoestring; her sister's designer dress swap-shop, Julies knows that she just has to wear it to the wedding. Only that dress will get her through the day, and show everyone that can cope. The dress costs 1200 Euro - and Jules is broke. Enter Arietty; elephant keeper at Dublin Zoo - she needs a 'knock em dead' outfit too, so that she can attend her school reunion and show the bullies that she's done OK. Jules and Arietty devise a plan - they will time-share the dress, they just need two more members of the club and the dress will be theirs. The Shoestring Club is a multi-layered story, and although at first Jules seems to be quite a shallow person, her main interests being clothes and how much she can drink, the reader soon realises that under that bright exterior is a sad, vulnerable girl. This is the real beauty of this book, one moment I was smiling, or sighing and the next I was gulping back the tears. The dress is the cover story, the real story is gently unfolded as Jules stumbles through life from one crisis to another - exposing her vulnerabilities, her sadness and most of all her strength of character. The supporting cast of characters are excellently created - some adorable, some hateful, but all of them truly believable, each adding to the novel in their own special way. I enjoyed every page of The Shoestring Club, it's warm and funny, and sad and uplifting - all at the same time. Sarah Webb has a website here, she is also on Facebook, or you can follow her on Twitter. A huge thanks to Pan Macmillan for sending me a copy for review. I read Tamar Cohen's first novel The Mistress's Revenge back in April 2011 (my review here), and loved every page of it. I was delighted to receive a copy of her second book The War of the Wives to review. 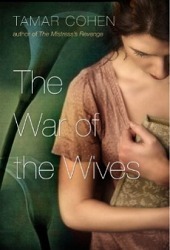 The War of the Wives was published in July this year, by Doubleday at Transworld. Tamar Cohen is a very accomplished author, she writes stories that do not shy away from controversy, featuring characters who are often very easy to dislike. Her first book featured an adulterous affair, this one centres around the almost never talked about subject of bigamy. Simon Busfield is dead, dragged from the river in a part of town that he had no business visiting. His wife Selina has to cope with the shock of his sudden death, and so does his wife Lottie. Yes, two wives, totally unaware of each other. Selina and Simon have been married for the last 28 years. Lottie and Simon have been married for the last 17 years. Two very different women, one husband - the same husband. The story is narrated in turn by each wife. Classy Selina; cool, calm, in control. A beautiful house, the perfect family. Ditzy Lottie; bohemian, scatterbrained mother of one. As the two women discover more and more about their shared husband and his secret life their own lives become connected. Tamar Cohen portrays Selina and Lottie's struggle to come to terms with Simon's death wonderfully well, their feelings of betrayal and their anger and despair as they realise that their life has been a lie. There is an underlying feeling of something dark and quite seedy running throughout the story, the mystery around how and why Simon died. The suspense continues right up until the end of the story and had me gripped, and although the explanation and the ending of the book is maybe a little over the top, it is extremely well written. I was very impressed with this second novel, I enjoyed it just as much as her first book. The writing is quite unique in style and kept me engaged right up until the very last page. My thanks, as always to Lynsey at Transworld who always finds the perfect books to send for review. Everyone has heard about the success of a certain self-published author recently, those books are everywhere .... and the copy-cat novels, and the debates! 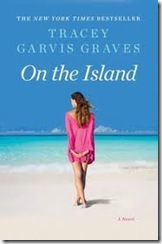 On The Island by Tracey Garvis Graves is another success story for self-publishing. The novel spent a couple of months on the New York Times Bestseller List and has is now being published in the UK by Penguin on 16 August. It has a couple of thousand reviews on Amazon.com ranging from 1 to 5 stars. I really have been surprised by how much I enjoyed reading On The Island. If I were giving a star rating for pure enjoyment, then it would most definitely be a big fat 5. I am actually going to give it a 4 - purely because at times the writing was a little clunky and disjointed and some of the dialogue grated on me, but that really didn't stop me from immersing myself in the story and enjoying it. The story is a little bit of Blue Lagoon and a little bit of Castaway, with Anna and TJ finding themselves alone on a deserted island in the Maldives after the pilot of their seaplane has a heart attack and the plane crashes into the sea. Anna is thirty-one, TJ is fifteen - Anna is his tutor for the holidays and they've only met once before. Once the realisation sets in that they are alone, the pair of them concentrate on surviving and hoping that they will be rescued. It seems that everything that could happen to them, does happen to them. Sharks, storms, illness, and of course the inevitable romance! It takes a while, but as time passes and TJ turns from boy to man, their relationship changes. This is the perfect summer's day read, by the pool or the beach, or in the garden with a glass of something chilled. My thanks to Real Readers for sending me a copy to review. Tracey Garvis Graves has a website, you can follow her on Twitter, or visit her Facebook page. 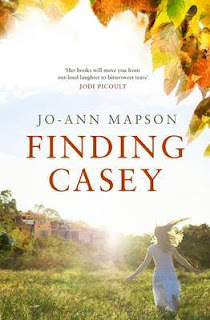 Although Finding Casey is the sequel to Jo-Ann Mapson's 2010 novel Solomon's Oak, readers can still enjoy it as a stand-alone story due to the author's expertise in providing background details whilst not straying from the current plot. 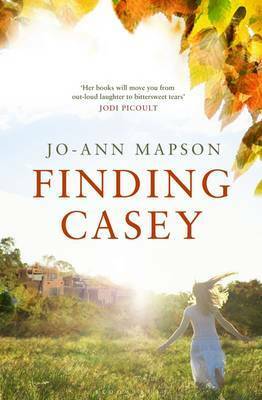 Finding Casey finds Glory, her new husband Joseph and their adopted daughter Juniper living in Santa Fe, New Mexico, having left California behind to make a new life for themselves. All three of the main characters have troubled pasts; Glory lost her beloved first husband Dan when he died suddenly; Joseph suffers with injuries caused during a shoot-out when he was working for the Police, and Juniper has clawed her way back from homelessness, the suicide of her Mother, and the disappearance eight years ago of her elder sister Casey. I read Solomon's Oak a while ago and enjoyed it. I was looking forward to seeing how the story and characters would move on in Finding Casey. I was not disappointed, in fact I think that this novel is far better than the first, with a stronger storyline and a much faster pace. Jo-Ann Mapson has cleverly weaved in a parallel storyline; a young woman called Laurel has escaped from what can only be described as some sort of sect to take her very sick daughter Aspen to the hospital. As Laurel's story slowly unfolds, alongside that of Glory and her family, the reader becomes caught up in what is often quite a tense drama. This is a powerful story, well written with warm, humorous and engaging characters. It is about the bond of a family, a little bit of ghost story, some folklore and a hint of suspense. My thanks go to We Love This Book for giving me the chance to read and review Finding Casey. Jo-Ann Mapson is on Twitter, and Facebook.